Truth be told El Primo was pretty lousy when it first opened. As is my custom when a new cart appears in Austin I hit it good and hard for awhile to get the lay of the land, figure out what the strong suits are, then act accordingly. 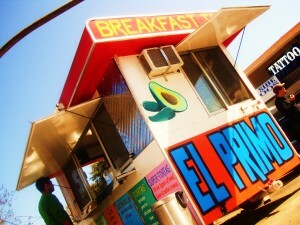 The taquero at El Primo was earnest and congenial but his tacos weren’t very good. Then, like magic, Once Over Coffee Bar opened up a stone’s throw away, the cart’s business went through the roof and respectability was attained. No, El Primo will never be a top tier food source. To roost at the top of the pecking order in the Austin Mexican food world you must make your tortillas from scratch. Factory tortillas will never carry you to the promised land of taco greatness. The two are mutually exclusive. But when I’m on a roll at Once Over and the epistolary skills are being honed at a frightening pace-I will occasionally grab a couple tacos from El Primo so I can continue my output with minimum distraction. Nourishment is at hand when you dine at El Primo. This entry was posted in Texas Daily Photo and tagged Austin, bacon, bacon egg cheese, breakfast tacos, corn tortilla, egg, food trailer, Mexican, Restaurant, salsa, south austin, Taco cart, taqueria, tortilla. Bookmark the permalink.